A helicopter hovers over an active osprey nest to count the number of eggs. Image courtesy NJFW. The New Jersey Osprey Project began after the osprey was listed as an endangered species in 1973. In April 1974 an aerial survey was conducted to count the number of active osprey nests. The survey was conducted from Toms River to Atlantic City. The results were grim. Only five active nests were found. 10 years earlier there were over 50 in that same area. 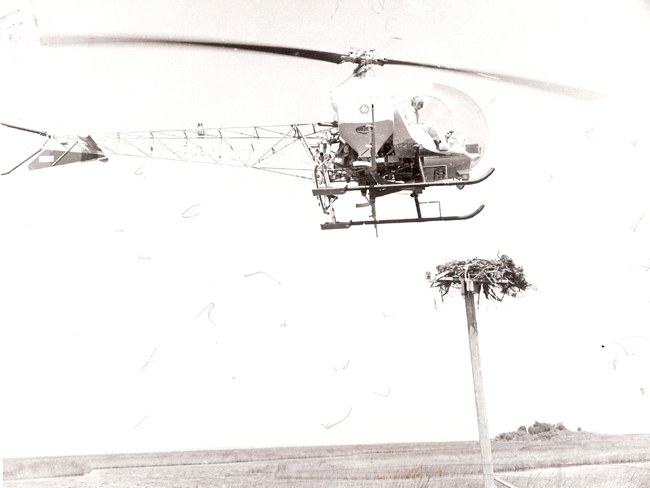 On all of Barnegat Bay in 1974 there was only one active osprey nest. The heavy use of DDT in the 1950’s and 60’s was the main culprit in the decline of ospreys by affecting their ability to reproduce. When used in marine environments it was quickly absorbed by organisms and soils. It accumulated in the food web and because it was fat soluble it bioacummulated in predators, especially birds of prey. In short, it caused the thinning of eggshells which often broke under the weight of the incubating female. This threat, along with habitat loss and persecution caused the population to become almost extirpated from the state. In 1974, Pete McLain, a biologist with NJ Fish & Wildlife, was the project leader for this new initiative. To combat the infertile eggs found in many NJ osprey nests, Pete made arrangements and flew to Maryland to retrieve fertile eggs from nests on the Chesapeake Bay. There DDT was not used as heavily and ospreys were not in such a dire situation. There they collected 16 eggs and transplanted them into five active nests in NJ. Five eggs from NJ nests were taken to be incubated with hopes they would hatch. The nests in NJ where the Maryland eggs were placed were monitored on a bi-weekly basis. One nest was on a fire tower in Island Beach State Park. A total of four young fledged in 1974. The others were lost for misc. reasons. The successful egg transplant program was expanded the following year to Sandy Hook and other colonies to the south. Read the full article about the egg transplant program for more info. To put things in perspective, in 2011, there were over 50 active osprey nests on Barnegat Bay alone. Surveys covered approximately 70% of the state population which gives us a pretty accurate assessment of the overall health of the population. Volunteers and biologists counted a total of 345 active nests. 295 (# of active nests where the outcome was known) of those nests produced a total of 612 young, the most ever in the history of the project. With this data we were able to calculate the average number of young that were produced which was at 2.07 young/active (known-outcome) nest (another milestone in the project’s history). 412 of those young were banded for future tracking. One of those young produced last year was recently encountered in Colombia. It was found to be entangled in old fishing nests and many locals there worked to try and save the bird. To read more about this encounter, check out the NJ Osprey Project blog. Today, the efforts of Pete McLain and his colleagues with the Endangered and Nongame Species Program has paid off. While the population is still listed as a threatened species, state-wide monitoring efforts have been scaled back because of this remarkable recover and because of the large survey effort by biologists and volunteers. The next state-wide aerial survey has been postponed until 2013. 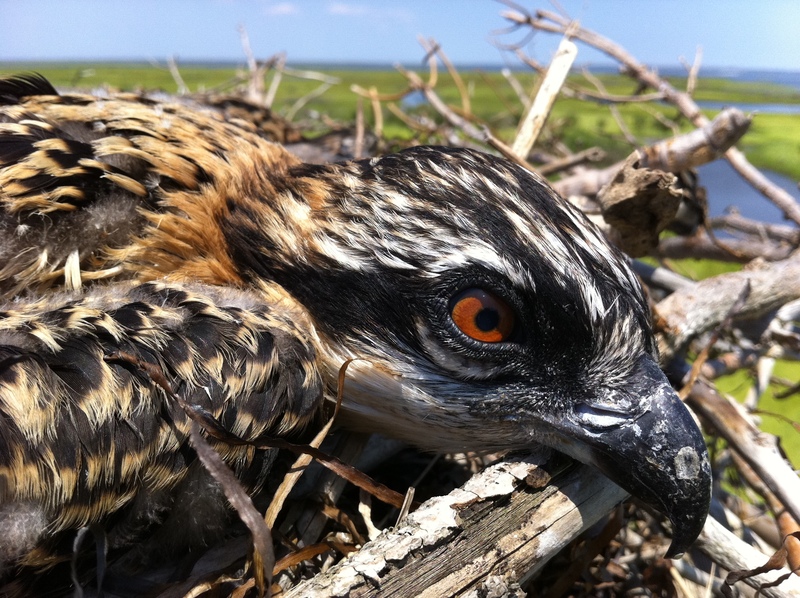 For more information on the overall results from the 2011 breeding season, check out the 2011 Osprey Project Newsletter. To learn more about our work with ospreys and for ways you can help, visit the Osprey Project page on our website. Follow NJ Osprey Project on Facebook for updates from the field. Thank you to all our volunteers who help us monitor the state population! This entry was posted on Thursday, February 16th, 2012 at 12:29 pm	and is filed under Raptors, Wildlife Protection. You can follow any responses to this entry through the RSS 2.0 feed. Both comments and pings are currently closed. Great web site and blog. I see ways to share your site and blog but not to subscribe. Am I overlooking it? Thanks for the compliments! Good question. I’m checking into getting a widget for people to be able to subscribe to receive notifications when new posts are published. Thanks for reaching out! I’ll let you know when I find out some more info about it.